“The sky’s the limit if you have a roof over your head.” (Sol Hurok). Well, not if the roof leaks! Today we address the question of how Chiangmai Life Construction ensures that bamboo roofs such as that of our Showroom & Office unit and that of Panyaden School’s are well protected from the rain. Generally, roofs in tropical climates need to be sloped or pitched at a certain angle (the ‘pitch’ is the angle at which the roof rises from its lowest to highest point, http://en.wikipedia.org/wiki/Roof). This pitch is determined by the type of roofing material used, by the weather (areas with heavy rainfall tend to have steeper slopes) and by local or national building laws. 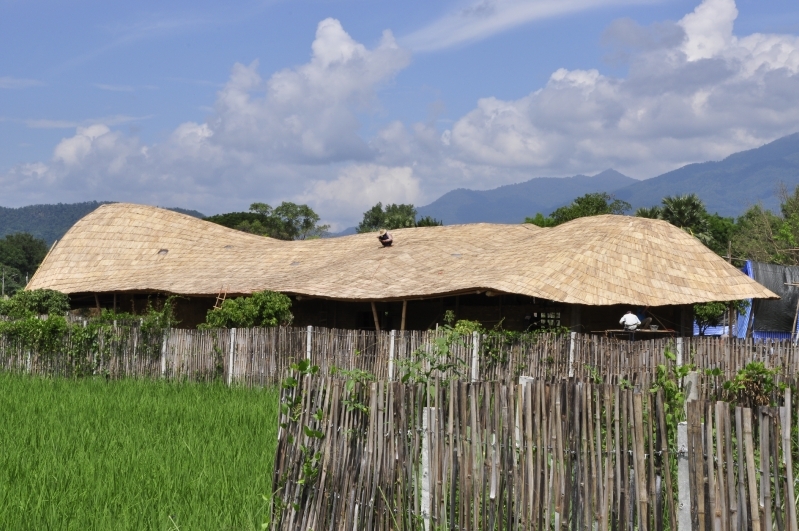 At Panyaden, the bamboo trusses (the roof’s support structure) are built and joined together at a calculated angle. These are then bolted to the load bearing walls before they are layered with bamboo nets and shingles. 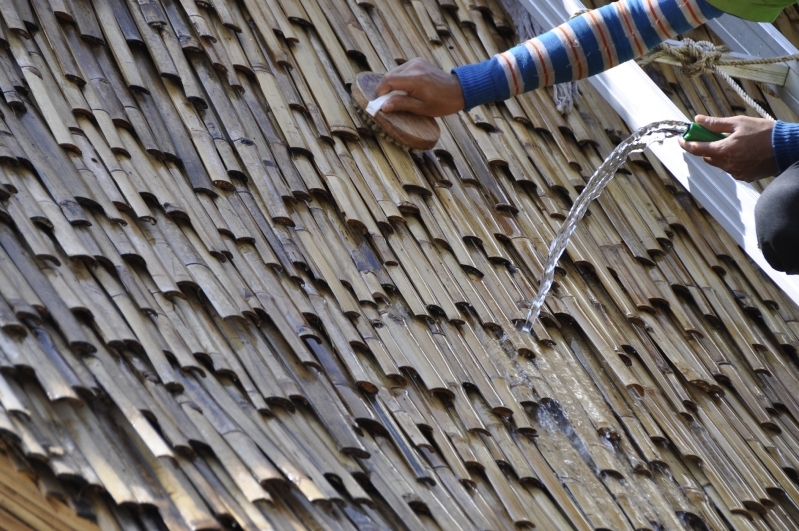 Markus Roselieb explains, “Any roof needs to be first tiled at a certain angle without a water proofing layer. Smaller tiles tend to need a steeper angle whilst longer ones can have a flatter angle but the manufacturer should be able to tell you the minimum degree of slope so that the water will not be pushed up along the tile into the roof. The bamboo trusses are first coated with 2 – 3 layers of rubber tree oil (น้ำมันยาง or ‘naam yang’ needs to be thinned before use because of its viscosity). The oil helps to protect the bamboo from moisture. 1. The under-structure consisting of a woven bamboo net. 2.Over that net is the first layer of interlocking split bamboo stems/shingles. 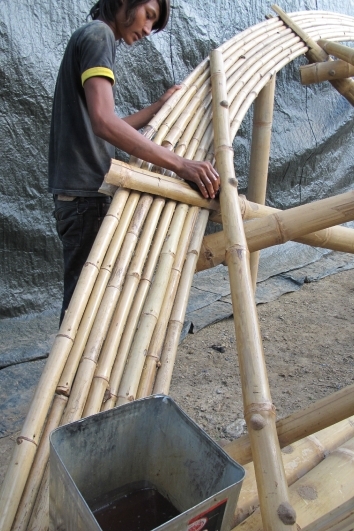 3.Then comes a second layer of structural bamboo on which the outer roof is fixed. 4.A layer of split bamboo is installed on that outer roof. 5.Next is to layer on thick sheets of linen soaked in tar. 6.Finally, an outer layer of split bamboo is overlaid. This is further treated with rubber oil to protect and insulate the bamboo from the rain. “There is absolutely no way the water can come in. The first nursery/kindergarten building, for example, has been through the recent heavy rainy season and it has stayed dry,” says Markus. The large overhang of the roofs helps direct the rain water away from the earthen walls into the school’s water drainage system.